On Friday, September 22nd we held our first Open House at our new headquarters in Northwest Work Lofts. 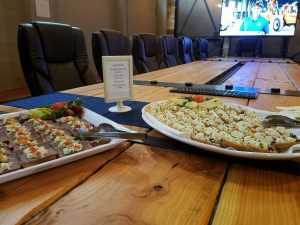 Coordinated in partnership with Britta Ambauen Jewelry, the event brought Atlas customers, business owners throughout Northwest Work Lofts, and friends within the community together for an evening of fun and networking. After spending months of weekends and long evenings working on our new office space, it was incredibly rewarding to see it used the way we envisioned. 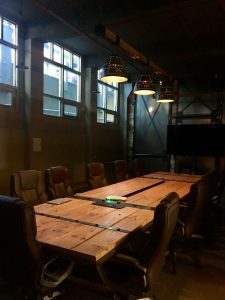 People were especially impressed with the conference room including the custom-built table, barn door, and lighting (designed by our CEO Ryan Maloney). 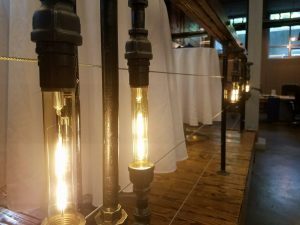 Everything, from the desks to the bar area and lighting fixtures, were hand-built by Atlas Staff. It was a pleasure to show off! 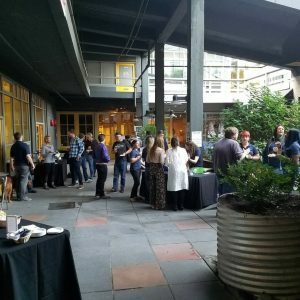 The food (catered by Classic Catering) was spread out both inside and outside the building and a professional bartender served up creative combinations (such at the Gigabit Special and VOIP Sidecar) all evening. We’ve used Classic Catering on a couple different occasions and always have a great experience! They are timely and professional, and the food tasted great. To put it simply, the place was packed! It was a great opportunity to meet our neighbors and converse with community members and customers. 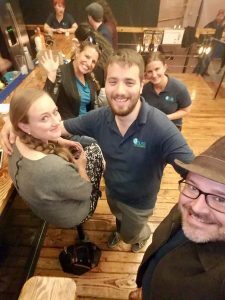 Northwest Work Lofts is home to so many businesses, but we rarely get a chance interact with each other. We walked away feeling as though a step was taken towards community building and business awareness. 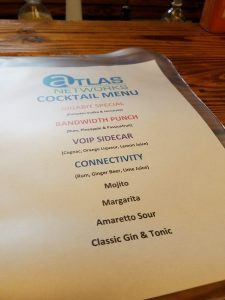 Overall, it was a wonderful experience and an awesome sneak peek of what future Atlas Networks events will look like – stay tuned! Ready to get connected to high-speed Gigabit Internet at an affordable price? Contact us today to see if your building is part of the Atlas Network.